The Gruyere popover. The heirloom tomato salad. The 8 oz. filet. The mac and cheese. My dinner at BLT Steak (located at the W Atlanta Downtown) left my taste buds tantalized — and my waistline in need of a sweat session. So when my body woke up raring to go at 6 a.m. on Sunday, it was off to the hotel’s gym, appropriately named “Sweat,” to get my day off to a fit-and-well start. Now, you know me. I love a good hotel gym. 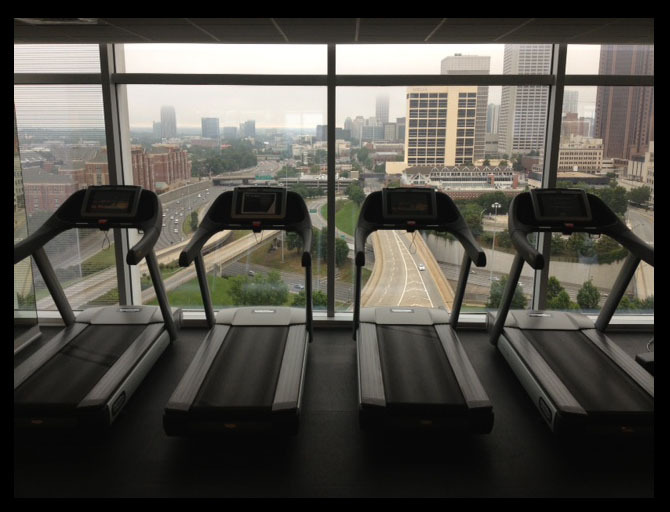 Sweat’s cardio equipment overlooks the Downtown Connector and Midtown. And if the view isn’t enough of a distraction, all of the treadmills, elipticals, etc. are equipped with a TV. I stopped by the lobby to fix myself a complimentary cup of tea, complete with milk and honey (coffee is available too, folks) and headed back to my room to get beautiful for breakfast at BLT Steak. I had the restaurant all to myself at 9 a.m., and I enjoyed the peace. I was seated by the window that overlooks the valet area, so watching the people who were coming and going at that hour was entertaining. After the indulgent dinner the night before, I decided to say “negative” to the BLT Popover — another one of those Gruyere soufflesque puffs of bread complimented with spinach, ham, eggs, bacon, béchamel, and hollandaise — that was beckoning me to order it. Instead, I enjoyed the veggie frittata (pictured), which included Portobello mushrooms, asparagus, goat cheese, and tomatoes. OK, and I got one of the regular popovers on the side. I’m human, people. Following breakfast, my staycay came to a close. I will absolutely be back to BLT Steak and Bliss. Fit and fit. Until next Tuesday — stay FWABulous!